Hong Kong, December 2016 - Discussion with Mr. Govert Heijboer, Co-CIO of True Partner Capital and Russell Rhoads, CFA, Director of Education for the CBOE Options Institute talking at CBOE RMC where the 2nd Annual CBOE RMC Asia Volatility Panel Discussion took place about the current global equity markets. Mr. Heijboer noted that long volatility guys seem to be in the minority at conferences like this and being long volatility is like being the underdog. He noted that this has been the year of the underdogs, naming the Chicago Cubs as a perennial underdog who did good in 2016. He listed different ways to be long volatility such as owning a variety of options, listed volatility derivatives, or using over the counter solutions. He rhetorically asked why on earth you would want to be volatility and answered his question that volatility works when everything else fails. As an example he shows the performance of the Eurekahedge CBOE Long Volatility Index from 2008 when it was up over 45% for the year. As far as implementation Mr. Govert Heijboer discussed the high negative carry associated with being long volatility. Both time decay and term structure decay have a negative impact on being long volatility. To circumvent this cost he suggests an active trading strategy. 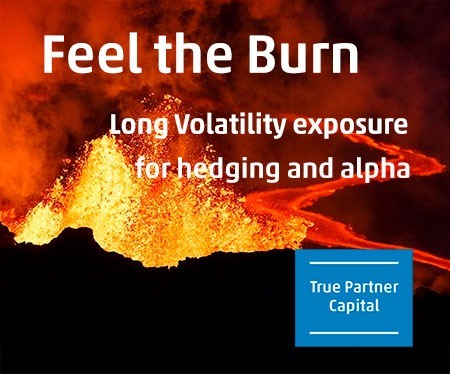 His firm True Partner Capital focuses mostly on short dated listed equity index options to long volatility exposure.